Following on from the 12 clothes Janice of The Vivienne Files suggested as a relaxed starter wardrobe, she added a group of 4 accessories. And I need to add some layers as I don’t live in a hot summer climate. So here are additions to my pattern suggestions in my previous post on this. She has posted another version of these casuals, for the whole summer, here and here. Janice is always good on suggesting accessories. Here she completes the casual red group by adding hat, scarf, and choice of tennis shoes or flip-flops. Changing the scarf and shoes is an easy way of completely changing the look of an outfit of simple basics. 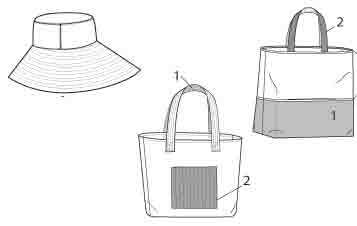 How about new McCall’s 6577 for both hat and tote. This capsule is very oriented to summer wearing when you only need only one layer, with occasional use of a knit cardigan or shirt-jacket for cool evenings. See my previous post for pattern suggestions. I don’t live in a hot climate, and need a layer. When you have a layering piece to work with as part of your outfit, I think the layer you choose can make a big difference to the overall style. 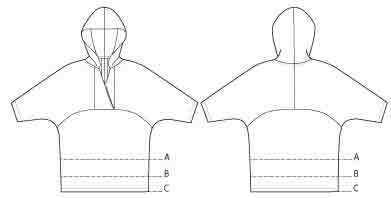 Continuing with Cutting Line patterns, for a layering jacket that closes fully there’s Pure and Simple. For a softer style I might choose a cascade/ drape cardigan. Definitely not a fitted blazer with this wardrobe – these clothes are too relaxed 😀 If you like the notched collar effect, choose an oversized boxy jacket to go over loose fitting tops. So many BMV patterns have appeared since I last wrote on big jackets, I’m planning a separate post on cascade and boxy styles ! For a more unusual look, Eileen Fisher this season frequently uses a poncho as her covering layer, in a gauze, mesh, or a very light knit. Cropped to elbow and waist length. For a pattern, cut your own rectangle by direct marking on the fabric. Or possibilities in new Butterick 5790. 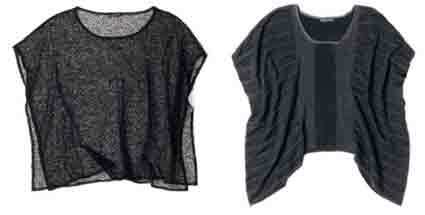 Or what Eileen Fisher calls a ‘box top’, basically a poncho with side seams. Simply sew up the side edge part way. 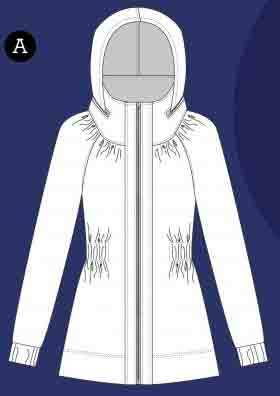 Or try Elizabeth Gillett’s ‘jacket’ version, new Vogue 8820 View C.
For outerwear I would of course choose a parka. See my post on parka patterns. Or Sewaholic Patterns’ new Minoru jacket is popular. This red relaxed group could make a good holiday-vacation travel wardrobe. Add an outerwear jacket to carry on the journey, swim suit and pareo, some camisoles or shells (one in a dressy fabric) – none take much packing space. Plus another layer in flat-packing style which could double as a robe. Such as a kimono (see my post) or caftan. Or another style made from rectangles. 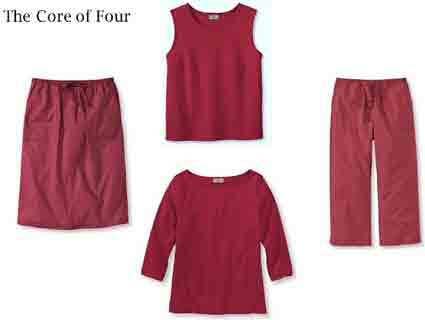 Janice of The Vivienne Files followed her post on building a wardrobe of red relaxed clothes with a related group in black and grey. Those are closely fitted styles, including a blazer, slim pants, leggings, and short tight skirts. More trendy-edgy than many of her recent selections, she calls them ‘less conservative’. Perhaps she and I use the word ‘conservative’ with different meanings – for me it is a rather negative word ! I don’t think the clothes in the red-based group are ‘conservative’ in the sense of old-fashioned and fuddy-duddy. I think of them as the simplest of relaxed basics. Think of the black and red groups as week/ weekend, city/ suburb, or town/ country selections. These are also more trendy and stylish. 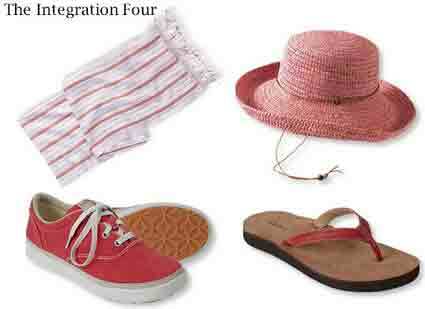 The ‘red’ group I’ve focussed on is best for relaxed wear. These wardrobes all have the same basic ‘Four by Four’ plan : one group of 2 tops 2 bottoms in one main colour, another group of 4 in the second main colour, a third group of 4 tops in mixed colours with added accents, plus 4 accessories. 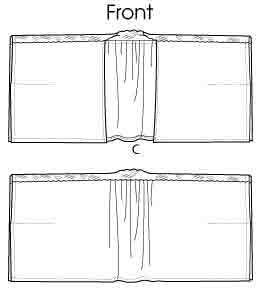 This is a very simple wardrobe building scheme. My final posts inspired by this wardrobe from The Vivienne Files are planned to be about simple personal wardrobe building. This entry was posted on June 23, 2012 at 8:40 am and is filed under personal style, specific capsules. You can subscribe via RSS 2.0 feed to this post's comments. Both comments and pings are currently closed. What’s missing for me is dresses. They are really all I want to wear from Spring through Summer and they are often overlooked in these types of plans. I wear tank dresses with a cardigan or lightweight stole, or if I’m going to be out in the sun, I wear tunic type dresses with long sleeves to protect my fair skin from the sun. Not to worry Sara – have a look at The Vivienne Files other posts. She suggests many other wardrobes which are based around dresses and how to style them. This casual group is quite unusual for her. The important thing is you know what’s right for you – so you can recognise which wardrobe plans are helpful for you and which aren’t. I am now mentally going through my summer closet, making up possible 4 by 4 collections and noting what I need to make or buy to complete them. This is very helpful! I think this is the first way of thinking about my wardrobe that works for my style and my way of thinking about things. Love that Eileen Fisher “box top”! What a quick and easy top to make, too! I’m on it! Looking at the ‘core of four’ image….hmmmm…well none of those would flatter me and I’d feel sooo scruffy. But then my idea of casual is a shirt dress or 50’s inspired top and maxi skirt. Oh and I always layer up (permanently cold even in summer) I think its essential in the UK climate. Yes, that particular group of 4 is not at all to everyone’s taste 😀 It’s good to be clear about what you like to wear so you don’t get distracted by other suggestions.